It would have been "abnormal" for Reeva Steenkamp not to scream while she was being shot, says the pathologist who conducted her autopsy, provided she had not yet received the head wound that knocked her out. Pathologist Gert Saayman said Steenkamp would have been able to "rationally conduct" herself despite other wounds until her boyfriend, Paralympian Oscar Pistorius, shot her in the head on Valentine's morning last year. A major point of contention in the trial will be the order in which the bullets Pistorius fired hit Steenkamp, as prosecution witnesses have insisted they discerned female screaming during and prior to the "bangs" they heard. The athlete, in his account of events, is adamant that Steenkamp made no verbal sound while she was behind the locked toilet door, so he mistook her for an intruder. If she received the gunshot wounds in her right arm and right hip before her head wound, she would have been filled with anxiety and fear, but still have been mentally acute, Saayman told the court during cross-examination Tuesday. The forensic expert, who has been involved with more than 10,000 autopsies, described the head shot as being "in its own league," saying it would have caused immediate incapacitation and loss of cognitive function. 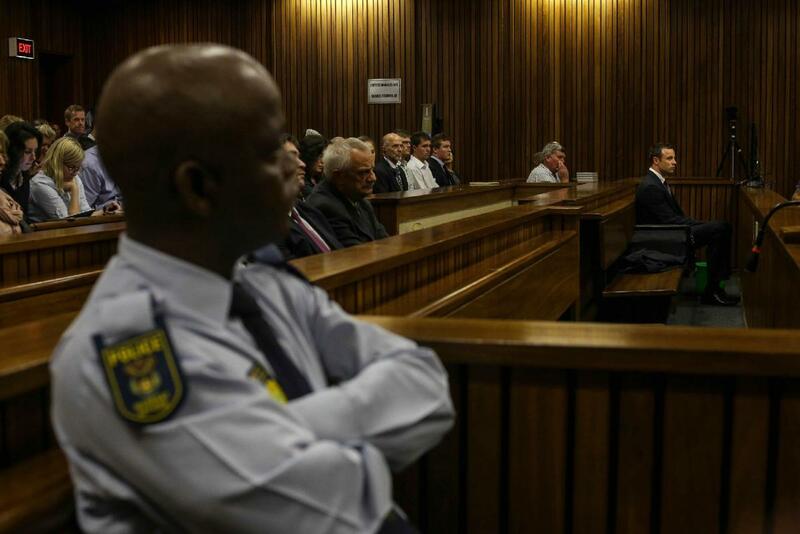 After an emotional start to the week, during which he vomited repeatedly while the pathologist described Steenkamp's injuries, Pistorius remained composed in the dock Tuesday, in a dark suit and metal-framed glasses, as Saayman continued on the witness stand. The pathologist's testimony also shed more light on the sequence of events, which raises some serious questions Pistorius' defense team will need to address. During his initial testimony Monday, Saayman described the matching bullet hole in Steenkamp's hip and the grey shorts she was wearing, suggesting she was clothed in the locked toilet. Saayman also estimated the time of her last meal as two hours before death, or around 1 a.m. – a direct contradiction with Pistorius' account of the evening that they had eaten a quiet dinner at home and gone to bed around 10 p.m. Despite his best efforts, defense attorney Barry Roux did not manage to shake the pathologist's position or his confidence. Saayman insisted that, based on his career's experience and 30 years of continuous reading on the subject, his estimates were accurate. The defense noted that Steenkamp's bladder only contained a "teaspoon" of urine, consistent with her going to the toilet to relieve herself. But Saayman pointed out that the same situation could be possible, in physiological terms, if she had been awake within an hour of her demise. The Pistorius side of the "family" bench fronting the public gallery is growing by the day. His sister Aimee, who has been present every day of the trial, alongside his uncle Arnold and his wife Lois – who Oscar Pistorius has lived with since being released on bail – have been joined by other members of the extended family, including aunts, cousins and the athlete's friends. But one of Pistorius' former buddies found himself on the witness stand instead of the supporters' bench – testifying against the man who killed one of his closest friends. Darren Fresco – who did a series of tearful television interviews after Reeva Steenkamp's death – is now a prosecution witness, but spent the afternoon seemingly battling to remember crucial details in his testimony. Telling the court of the Blade Runner's "big love for weapons," he described Pistorius firing his gun out of an open car sunroof and accidentally discharging a bullet in a busy Johannesburg bistro, for which he says he was asked to take the blame. In addition to the premeditated murder of his girlfriend, Pistorius faces charges of recklessly discharging a weapon on these two occasions. "If it's got Wheels or a Skirt it's Gonna Cost You Money," reads Fresco's Twitter bio, his testimony giving the court a glimpse into Pistorius' world, a social whirl filled with fast cars and firearms. Fresco says he met Pistorius several years before at a "breakfast run," where a convoy of car enthusiasts take their prize vehicles out for a spin. Fresco said the first shooting incident took place after they had been chased by police and stopped twice – once for driving without a license plate and once for speeding. When Roux asked if he had been travelling at 260 kilometers per hour – about 160 mph – Fresco said he could not recall. After being pulled over a second time, Fresco says a police officer picked up Pistorius' gun from the passenger seat, when the athlete had gotten out to see what was going on. An altercation followed, with Pistorius shouting, "You can't just touch another man's gun!" Fresco testified that while driving, soon after, Pistorius fired his gun through the sunroof with no warning. "I asked him if he was [expletive] mad," Fresco said. "He laughed about it; he just laughed about it." "What did you do with the [speeding] ticket?" Roux asked. "I crumpled it up and threw it onto the floor," Fresco replied, "because the police officer took too long to write it." Fresco says the luxury car dealership responsible for the vehicle – run by Pistorius' close friend Justin Divaris – paid the fines. In the second incident, which took place less than a month before Pistorius killed Steenkamp, Fresco said Pistorius asked to take a look at his gun, a Glock 27 – a .40 caliber weapon – which Fresco passed to him under the table. Although Fresco says he told Pistorius that it was "one up," meaning that there was a bullet in the chamber, Pistorius' defense insists the athlete did not hear him. Fresco says he believes Pistorius "cycled the existing bullet out of the chamber" without realizing he had cycled another in as the gun magazine was still attached. "I wanted to have said to him that the magazine was still in," Fresco said, "but I thought he would have checked." After the gun went off, Fresco admits to taking the lead in attempting to deflect attention from the group, telling them to "continue acting as if nothing had happened." Fresco, whose Facebook profile is littered with photographs of a smiling Steenkamp, constantly referred to Pistorius as "the accused," instead of by name. While his former mate testified against him, Pistorius continued furiously writing notes to his defense team. It was a marked departure from Monday's sobbing, heaving figure in the dock. During one adjournment, the Paralympian approached the Steenkamp side of the public gallery, reaching to shake a young man's hand. But when Pistorius stretched his arm out towards his female companion, she gave the athlete the cold shoulder. In cross-examination, Roux disassembled Fresco's testimony. During a lengthy interrogation by defense counsel, Fresco admitted to omitting several critical details in his written statement, said he had "blanks" in his memory around the events in question, and constantly revised his testimony. When questioned, Fresco admitted that he had visited a lawyer for assistance with his statement, in an effort to "avoid getting into trouble," but had not read the document recently. Fresco also admitted that he has been following coverage of the trial in the media and on Twitter, a blow to his credibility as an independent witness, especially as he referenced the testimony of other witnesses several times on the stand. At one point, he corrected the testimony of the wife of the restaurant owner where the gun went off, saying he would not have told her his gun fell out of his tracksuit pants. "I only wear tracksuit pants when I'm going to the gym," he announced to the court. In his testimony, Fresco contradicted several state witnesses' accounts of the two incidents, including Pistorius' ex-girlfriend Samantha Taylor and friend Kevin Lerena. He also contradicted himself, admitting eventually that he could not recall when Pistorius asked him to "take the rap" for the restaurant gunshot, saying it could have been after he had already told management that it was his fault. It was a comeback for the defense after a morning of testimony, which seemingly contradicts the star athlete's account of events. A visibly beaming Roux conferred with his client, a glimmer of a smile playing on Pistorius' lips.